Viewing topic "Playkeyz Purchase Problem…." I bought all 3 sound sets from Rick. There was only one file attached, which my XS did not recognize. I asked him to check the files and re-send. Never heard from him again. He may be a lawyer, but surprisingly, my time is valuable too. I would not buy from this guy again. If you don’t mind, I’ll leave Rick out of the discussion, and try to help you use the files you were sent. First, I’m going to presume that you have a Motif XS keyboard. I’m only mentioning that because your member profile doesn’t indicate that (it shows Rack ES), and you’re posting in the XF forum. Please update your profile if you now have an XS. File recognition is sensitive to context. The file won’t be displayed if the XS is in the wrong mode. It should be recognized if the XS is in Voice mode. For the other two files, what are the complete file names, including extension? The problem was not with me using the files. The problem was that one file would not load and one was corrupt. I asked Rick to re-send me the files, and was ignored. Then after a few days of being ignored, I filed a claim with pay Pal, and of course at that point Rick “found the time” to respond. “Sorry I could not get on the phone and walk you through using your instrument this week. That doesn’t mean you get the sounds for free. That’s the problem I have with you. Good luck, don’t contact me again. I never insinuated I wanted something for “FREE”. I never asked him to get on the phone with me for “tech support” or anything else, I never requested a refund either. I simplly asked him to re-send me the files. Which he would not do. If this is the kind of person anyone wants to do business with, by all means, learn the hard way, if there is a problem. I tried to remain neutral in this. However, since you ignored my attempt to assist you, it’s evident that you don’t want help, you just want to complain. I’m done, too. My intent was not to ask for help. 2 of the 3 files are not recognized by the XS. In voice or performance mode. If the motif can not see them, they can not be loaded. I appreciate the offer and you have helped me in the past. For that, thank you. I just wanted to share with others my buying experience from Playkeyz. I made the mistake of buying directly from Rick. When the better choice would have been buying the files from Motifator. If I would have known what I know now. I would not have bought the 3 soundsets. If you sincerely want to help, and possibly act as a mediary,send me the 80’s II and the Voice/Lead soundsets, since Rick won’t. They were corrupt and I’ve already paid for them anyway. I mean, what does it matter? I’ve already paid for them. If you paid for a product and didn’t receive it, would you be happy? 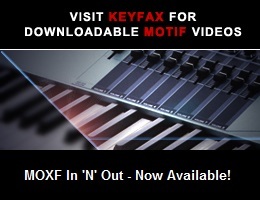 I said I was “done”, but something needs to be clarified - I don’t work or speak for Motifator/Keyfax. However, I’m still interested in determining where the problem lies, and possibly helping to resolve it for you. Your cooperation would be appreciated. Exactly what does “not recognized by the XS” mean? Does each file name show up on the display? I put the 3 files on a USB thumb drive, (formatted on the XS) and only one file shows up when the file button is hit, (80s1.X0A). It’s the same in performance (master turned off) or voice mode. I’ve reformatted the drive a few times and copied the files directly from Ricks emails. Still, only one file works. OK, let’s take this one step at a time. As you earlier mentioned, the “Leads” file is an X0V. For that to show up on the display, the load Type should be set to ”all voice”. It won’t be displayed and can’t be fully loaded with other Type settings. Please try that, and let us know the result. Before I just used “all” to try and load. I used “all voice this time. The lead file now appears in the file menu but will not load. When I press “Load”, nothing happens. Do you have a list of the sounds that’s supposed to come with that set? Rick only sent me the sound lists for the 2 80’s sound sets. Please elaborate on “nothing happens”. With Type set to “all voice”, and the file name highlighted, pressing [SF2](Load) should first result in displaying “Are you sure? NO/YES”. Does it? What is shown for the size of the file? What is the exact full name of the file? Please include all characters, including non-alphanumeric. Sorry, I only have the PDFs for the ones you already have.